A special thanks to Chip Wade for mentioning us in September's issue of HGTV Magazine. Live simple, live beautifully. Check out Annie Diamond of the Most Lovely Things blog on our versatile products. Houzz contributor Becky Harris shares a modern laundry room designed to meet mom's needs, especially if she has young children. Steele-ing the Show! Check us out in the Summer 2015 issue of Boston Home magazine. The Ackland Art Museum store at the University of North Carolina-Chapel Hill celebrates companies that have been manufacturing in the United States for over 50 years. Steele Canvas is proud to be featured along side North Carolina’s Cone Mills, Ohio-based Mosser Glass, and Minnesota's Faribault Woolen Mill in their "Made in America" exhibit. 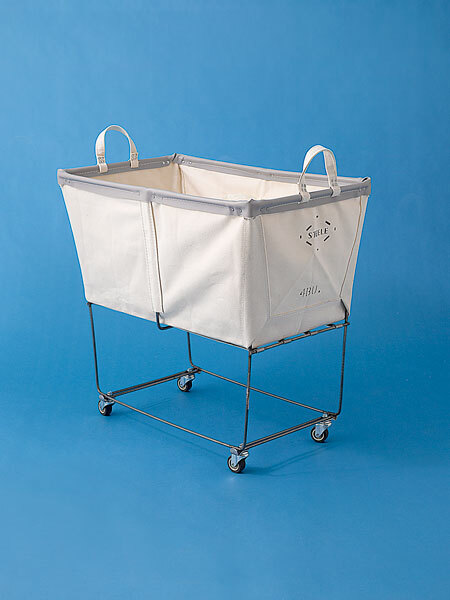 Remodelista Editor-in-Chief Julie Carlson picks her 5 favorite wheeled laundry hampers. Guess who's featured multiple times? Equipment managers from local high schools up to the Majors, and even the Olympic Games, have relied on Steele Canvas Basket to meet their equipment room needs. Whether your team is winning one for the Gipper, or just trying to avoid the agony of defeat, you'll never go wrong with a Steele Canvas Basket in your corner. Home designer and author Steven Randel provides the ground work ideas on to to build your dream laundry space. Leave the laundry baskets to us. "A family owned company has been making a version of this canvas bin since 1921. The raised bin is on a rolling frame, so it's easy to reach inside and to maneuver it." You know what they say: the family that makes laundry baskets together, stays together.